scientists have identified a gene present in hardy varieties of rice that enables the crop to tolerate flooded conditions. The researchers -- from the International Rice Research Institute (irri) in Manila, the Philippines, and the University of California Davis in the us -- have successfully introduced the gene into commercial varieties like ir-64 and Swarna and are now studying if the transgenic plants can survive submergence (see interview 'New varieties...'). The discovery of the gene -- Sub1A-1 -- is important, considering prolonged submergence of rice fields causes almost a us $1 billion annual loss, affecting nearly 70 million small and marginal farmers mostly in south, southeast and east Asia. Globally, about one-fourth of rice is grown in rain-fed lowland plots that are prone to seasonal flooding.For instance, in Bangladesh, 60 per cent of the area under rice cultivation usually gets submerged for a period exceeding one week. Most rice varieties die if fully submerged for more than four days. Submergence cuts off the oxygen supply and prevents photosynthesis. But Sub1A-1, found in varieties grown in Sri Lanka and India (in Orissa), enables these plants to withstand complete submergence for 10-14 days (Nature, Vol 442, No 7103, August 10, 2006). Rice varieties containing Sub1A-1 respond differently to stress -- like switching from aerobic to anaerobic respiration or growing above the water level -- but renew growth when the water level subsides. The gene controls hormonal changes related to cell elongation and carbohydrate consumption. 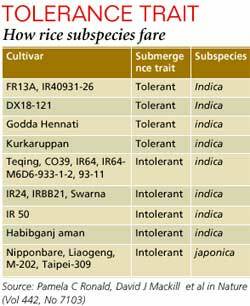 It is found only in the indica sub-species of rice, and not in the high-yielding dwarf japonica, say the researchers (see table Tolerance trait). The cultivars of japonica studied did not have a Sub1A-1 gene but a high incidence of Sub1A-2 and Sub1C, which induce flood intolerance. "The genes related to flood tolerance or intolerance trait belong to the submergence 1 (Sub1) group and occur on chromosome number 9 of the 12 rice chromosomes," says N K Singh, one of the leaders of the Indian group which participated in the International Rice Genome Sequencing Project (irgsp). The identification of Sub1A-1 is one of the first significant achievements after the complete genome sequencing of rice was done almost a year ago. "Though this fact of submergence tolerance was known for almost 50 years, any attempt to transfer this character to commercially viable varieties using plant breeding techniques have failed pathetically," says David Mackill, head of the division of plant breeding, genetics and biotechnology at irri. This time, biotechnology has helped in transferring the trait to other varieties, he adds. The earlier developed varieties lacked traits like good quality and taste that farmers require. The Indian team is gearing up for a breakthrough based on the drought tolerance gene that they had discovered while sequencing chromosome number 12 in irgsp. "In view of the benefits associated with this discovery and its introduction into flood non-tolerant Swarna, transgenic rice could soon be on the farmers fields," says Siva Prasad, Delhi based representative of the Rice-Wheat programme in Asia of the Consultative Group on International Agricultural Research. But he declined to comment on whether it would pave the way for the controversial 'golden rice'. The research has been funded by the us department of agriculture, the us Agency for International Develop-ment and the German Federal Ministry for Economic Cooperation and Development.